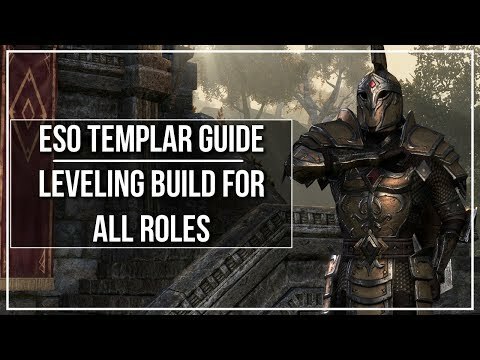 This video shows you various Templar Leveling Builds, one for each role, for the Elder Scrolls Online! This is intended to act as a framework for someone to follow while leveling a Templar, whether it be a magicka damage dealer, a stamina damage dealer, a tank or a healer. This is not a traditional "leveling build", but rather a framework that shows you some of the most commonly used setups for each role. This enables you to pick and choose from a list and mix and match how you like, thus preventing you from feeling like you have a static leveling progression! DISCLAIMER: The gameplay and images associated with Elder Scrolls Online are taken from the Elder Scrolls series of video games created and owned by ZeniMax Online Studios and Bethesda Softworks, the copyright of which is held by ZeniMax Online Studios and Bethesda Softworks. All trademarks and registered trademarks present in the gameplay and images associated with Elder Scrolls Online are proprietary to ZeniMax Online Studios and Bethesda Softworks, and the inclusion of them in this video does not imply affiliation with Dottz Gaming. The use of the gameplay and associated Elder Scrolls Online images in this video and any present in the thumbnail are believed to fall under the “fair use” clause of the United States of America copyright law.